Each Saturday evening during the Winter Equestrian Festival season, the stadium lights click on, the cars — packed with families — begin to trickle into the venue and riders begin to warm their horses up before their biggest class of the week. 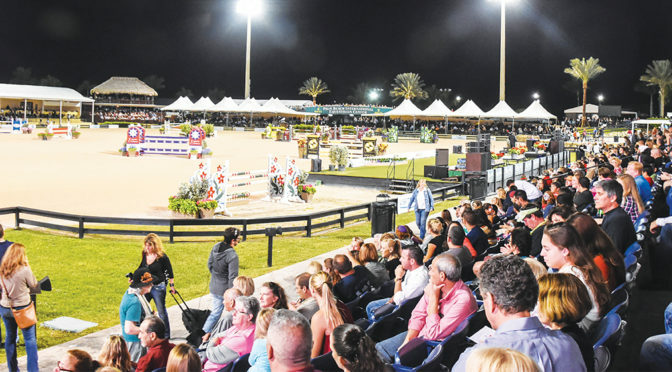 Welcome to Saturday Night Lights at the Palm Beach International Equestrian Center–. The weekly evening competition begins at 7 p.m. with the first horse and rider combination entering through under the iconic bridge, but gates open at 6 p.m. for the public and spectators, with a multitude of activities for the whole family to enjoy. General admission to Saturday Night Lights is free, and parking remains $20 per car load, providing a perfect, inexpensive evening for family and friends. Some of the PBIEC staple activities on Saturday nights include free rides on the Venetian carousel, a petting zoo, face painting and live music throughout the night. Occasionally, there are ponies on the grounds, some offering pony rides and others offering adorable photo opportunities with the kids. There are also a variety of performers in attendance, ranging from jugglers to men on stilts to the beloved bubble man. Many vendors keep their shops open for browsing during the evening hours, located around the International Ring. While exploring, spectators glancing into the ring and warm-up areas will be able to catch a glimpse of the riders walking the course, where they evaluate the jumps and create their plan for the evening’s competition. After all the activities, everyone in the family is sure to be able to find something to eat with the large variety of dining options available. There are many food trucks on site, serving everything from pizza to popcorn to tacos. For those looking for a formal dining experience, White Horse Fashion Cuisine is always open in season, and there are a number of VIP options available. VIP seating options include the Tiki Hut, the Gallery, Beachside, the International Club, the Wellington Club and Central Park. Each Saturday evening class features an elite Grand Prix competition, in which riders compete against one another, with entries ranging up to 40 combinations, as jumps can fluctuate in height from 1.50 to 1.60 meters, and the width can be measured up to 2.20 meters. Elements such as open water, liverpools, oxers, combinations of two or more jumps in a row, as well as decorated and themed jumps are all different components, which test the trust, communication and athleticism of the horse and rider. The competitors are among the best in the world, and it is common to see Olympians and elite champions jumping each week. The ultimate goal for participating combinations is to leave all the jumps standing and cross through the timers within the time allowed, or be assessed time penalties, which will prevent riders from moving forward to the jump-off. Combinations who finish within the time and do not knock down any rails during their trip around the course will return for a second round against the clock, known as the jump-off. The jump-off will have fans holding their breath, as riders navigate risky turns and dash at speed around a shortened course to determine the winner. When there’s a tight race to the finish, the crowd goes so silent you could hear a pin drop. An eruption of applause and cheering takes over when riders finish through the timers without incurring any faults, while the victor usually treats the crowd to an emotional celebration after crossing through the timers. The top three finishers take to the podium for the well-known champagne shower before taking a victory lap with their equine partners, with many riders tossing their ribbons to lucky fans in the stands or signing autographs near the in-gate. At the conclusion of the class, the evening continues at the Gallery with an exciting after party, which all adult guests are invited to join and celebrate the evening and its top finishers. For more information about Saturday Night Lights at the Palm Beach International Equestrian Center, visit www.pbiec.com.